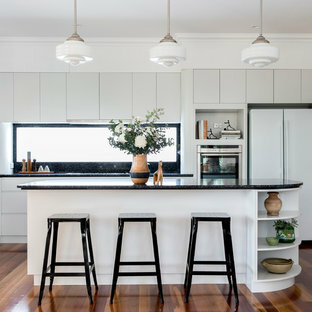 This is an example of a mid-sized contemporary l-shaped kitchen in Brisbane with white cabinets, black splashback, medium hardwood floors and an island. 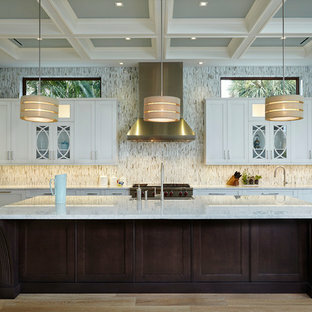 Inspiration for a large transitional l-shaped separate kitchen in Miami with shaker cabinets, white cabinets, multi-coloured splashback, stainless steel appliances, light hardwood floors, an island, an undermount sink, marble benchtops, matchstick tile splashback and brown floor. Aston | Art Deco Inspiration. 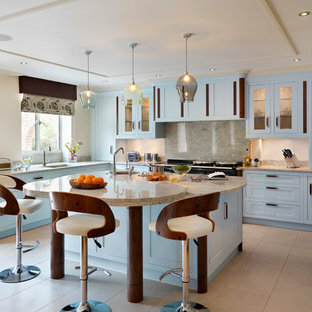 Heavily inspired by the Art Deco movement of the early 20th century, the Aston kitchen uses hand painted pale blue cabinetry, typical of the Art Deco style. 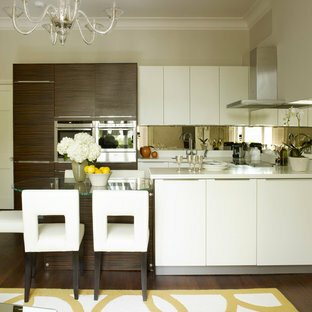 Photo of a transitional kitchen in Surrey with an undermount sink, flat-panel cabinets, grey cabinets, grey splashback, black appliances and an island. 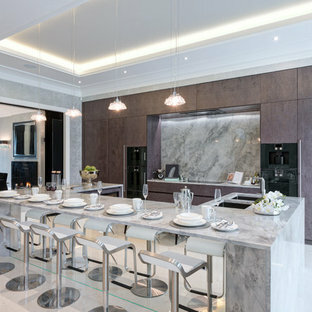 Traditional open plan kitchen in London with beaded inset cabinets, dark wood cabinets, white splashback, stone slab splashback and marble floors. Designed specifically for an original art deco home, this kitchen celebrates the curves and striking veneers synonymous with the era. An island bench with curved ends is set off by a flood of natural light during the day and glass pendant light fittings by night. 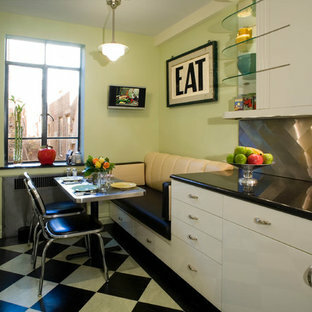 Vintage table and chairs with an upholstered banquette create a cozy eating, working and gathering spot. 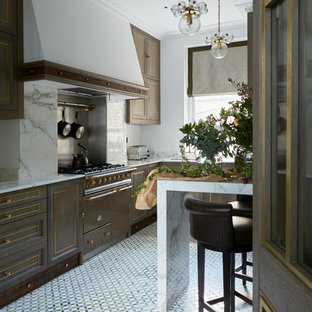 Inspiration for an eclectic kitchen in New York with granite benchtops. This is an example of a small contemporary u-shaped eat-in kitchen in London with an undermount sink, flat-panel cabinets, white cabinets, quartz benchtops, metallic splashback, mirror splashback, stainless steel appliances and an island. NYC Eastside Art inspired remodel "glitterati kitchen"
Photo of a small transitional kitchen in New York with grey splashback. A new fascia wall in front of the existing windows is built, housing the authentic 1920 portholes, salvaged from a ship. The windows preclude the unsightly outside street view while permitting light to stream through. It also evokes a sense of mystery as to suggest perhaps some unknown reality lying beyond. The gears faucet is unique and mirrors the industrial and streamline metaphors of the time. In addition, a brass rail is used as a curtain rod, with Greek key gimp used as ties to hold the curtains up above the top of the windows. The use of ornate lighting fixture, black tiles, geometric forms, and chrome has really captured the Art Deco style in the space. Contemporary kitchen in Los Angeles. Photo of a traditional l-shaped separate kitchen in Moscow with grey cabinets, white splashback, stainless steel appliances, marble floors and no island. 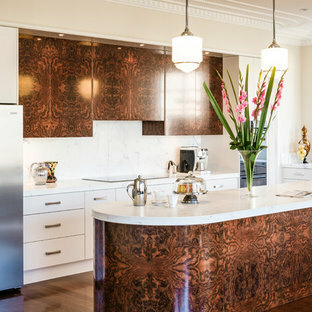 Photo of a contemporary galley open plan kitchen in Los Angeles with an undermount sink, flat-panel cabinets, green cabinets, marble benchtops, white splashback, ceramic splashback, stainless steel appliances, an island and black benchtop. Photo of a transitional kitchen in Toronto with recessed-panel cabinets, quartz benchtops, white splashback, ceramic splashback, stainless steel appliances, black cabinets and multiple islands. This is an example of a large contemporary galley open plan kitchen in Rennes with an undermount sink, stainless steel cabinets, wood benchtops, medium hardwood floors and an island.